Whether for a full-blown business conference or a relaxing incentive trip for two, Velas Vallarta Suite Resort & Convention Center meets planners' needs in a single ten-acre location on the beach in Puerto Vallarta. What's more, the all-inclusive policy makes budgeting a breeze while pleasing the most demanding of guests. Meanwhile, the Velas Convention Center holds meetings for up to 700 people in five versatile venues. Served by independent access from the property's main entrance, all conference rooms feature advanced technology including wireless Internet access, audiovisual equipment, and videoconferencing capability. The array of outdoor sites includes beachfront and tropical gardens for custom gatherings of every description. For impromptu celebrations, the resort provides live entertainment seven nights a week on themes like Mime, Casino, Prehispanic, and Mexican Nights. The property was clean and welcoming. Puerto Vallarta, Mexico (May 24, 2017) – The gift of a rose bears many meanings and has been used in countless occasions to express joy, gratitude, love and friendship. Now, Velas Vallarta resort in Puerto Vallarta treats guests celebrating something special to a shimmering embossed rose. The roses are embossed with a short phrase, name, monogram, character or other design based on the celebration. Arrangements come in an assortment of petal colors, including red, white, yellow, pink, and coral, and a variety of inks, from black, white, red, yellow and blue to gold, silver and bronze. For destination weddings, the bride and groom's names or initials will be embossed upon the rose petals. Guests can order additional rose bouquets (6 roses) starting at 420 pesos (approx. $22 USD) at least 72 hours in advance. Upon arrival, any requests for the embossed roses can be made directly with the concierge. Nightly rates at Velas Vallarta start as $153 per person per night, based on double occupancy. All-inclusive rates include suite accommodations, a la carte gourmet meals at a variety of specialty restaurants, premium branded beverages, 24-hour in-suite service, fitness center, taxes, gratuity and more. For reservations or more information, please call 1-888-407-4869 or visit www.velasvallarta.com. 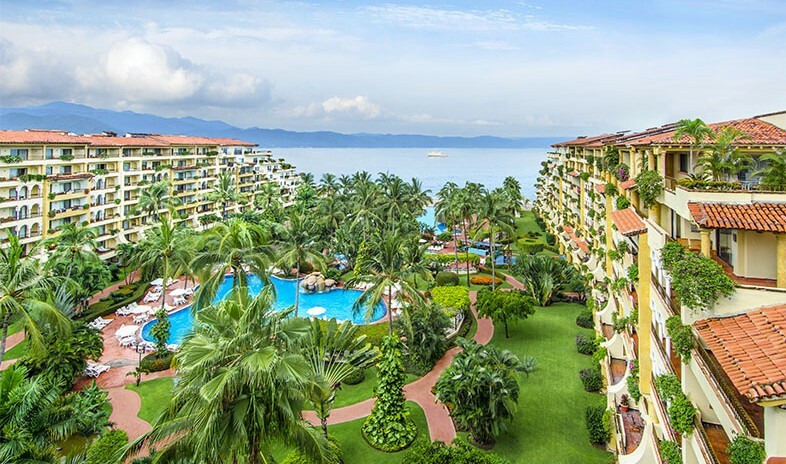 Velas Vallarta is an all-inclusive family resort located on 10 acres of oceanfront with lush gardens in Puerto Vallarta, walking distance of Marina Vallarta Golf Course and just minutes from downtown Puerto Vallarta. Situated on the emerald waters of Banderas Bay, Velas Vallarta features 345 suites in three eight-story buildings, a high-tech Convention Center that can accommodate up to 700 people, three swimming pools, a rejuvenating spa along with spa cabins seaside, fitness center, multiple restaurants, and an inviting lounge with live music. Nightly theme dinners and local specialties are sure to please even the most discerning palate, and room service is available around the clock. When it comes to daytime and evening entertainment, guests can choose from an exciting and original array of activities and events, from making piñatas and jewelry, yoga on the jetty to Mexican fiestas and casino nights. The recently renovated Kids' Club also welcomes children under 13 with supervised activities like a treasure hunt, face painting, sand castles to crafting with beads, allowing parents to indulge in a choice of exciting or relaxing pursuits like a game of golf, a variety of excursions or pampering at the spa. In addition, the resort was one of the first in the destination with a Green Globe certification, dating back to 2008. Puerto Vallarta features championship golf courses, world-class spas and magnificent beaches, not to mention various sports and activities up in the Sierra Madre Mountains. The possibilities for rest and relaxation, or fun and excitement, are endless. Velas Vallarta was built and is operated by Eduardo Vela Ruiz, owner, founder and president of Velas Resorts, with brother Juan Vela by his side, vice president of Velas Resorts. A new sea turtle experience debuts at Velas Vallarta in Puerto Vallarta, Mexico that allows guests the opportunity to participate in conservation training, hatchling releases, nesting patrol and cleaning of hatching nests. Available from June to December, the new program at the EarthCheck certified Gold resort is in addition to on-site behind-the-scene Eco Tours. Upon arrival guests participating in conservation training will receive a talk on sea turtles and conservation activities. The talk will introduce guests to the world of marine conservation, sea turtle biology and what they will be able to take part in during their stay. Once the talk is completed and questions answered, guests will receive a Sea Turtle Team In-Training T-shirt. During a release, guests will be given a sea turtle hatchling at sunset and then will accompany the biologist down to the beach where a rope is placed five meters away from the sea. Guests will stand behind the rope and place their hatchling on the sand. Hatchling Releases are for no more than 30 people. Groups of no more than 10 guests will also be able to accompany the biologists patrolling the beach for nesting sea turtles from 9 - 11 pm. Upon encountering a female sea turtle, guests will wait in silence five meters away from the turtle until the biologist indicates that the sea turtle has entered her nesting trance. At this point guests will be able to approach the turtle and sit down by her side during the nesting process. Once the female turtle has returned to the ocean, guests can help collect the eggs and transport them back to the hatchery. If guests choose, they will be able to partake in cleaning the hatchery at Velas Vallarta, removing live and dead hatchlings and unhatched eggs. All sea turtle programs are offered according to Mexican legislation on the conservation and protection of the species. Groups can also enjoy eco-tours, daily poolside games and activities like beach volleyball and water polo. Parents can enjoy quality time relaxing on the beach while children and teens (ages five to 17) discover the recently renovated Kids Clubcomplete with X-box stations, air hockey, pool tables and even a beverage station serving up beautiful non-alcoholic cocktails. Specialty guides lead behind-the-scenes eco tours, taking guests to hotel areas seldom seen by visitors including the solar panels, which heat the showers and pool water, and recycling facility. For aesthetic purposes, guest rooms do not have blue boxes but all garbage is sorted and recycled, where possible, to minimize waste. Tour participants learn how composting is keeping plants healthy and reducing the use of pesticide chemicals by one half. Guests also get a rare peak at enclosures used to house resident peacocks and injured wild birds and the turtle nursery. Groups can also discover the rich Puerto Vallarta culture through nightly live entertainment including traditional dances and local music.